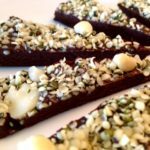 TCK's version of chocolate superfood ganache - packed with the health benefits of raw cacao, maca, spirulina, lucuma, hemp and much more! Whiz all ganache ingredients in a blender until smooth. Pour mixture into a 10cm square baking tin or springform cake tin, lined with baking parchment, and sprinkle over the seeds and nuts. Place tin in the freezer for 20 minutes or until ganache is set, then cut into portions. Serve from semi-frozen.